Geordi La Forge was born on February 16, 2335 in Mogadishu, Somalia to parents Captain Silva La Forge and noted exozoologist Commander Edward M. La Forge. Due to a birth defect, he was born blind. As an adult, he stood 170 centimeters (appr. 5'7") tall and was right-handed. Sometime prior to 2340, Geordi was trapped alone in a burning building; he later remembered this as one of the most frightening moments of his life. When he was five years old, Geordi received his first VISOR, which allowed him to see (although not the same way the average human does) for the first time in his life. At age eight, Geordi was brought his first pet, a Circassian cat, and he remembered his excitement for years to come. Young Geordi spent time with both his parents as a child, sometimes separately. For a time Geordi lived with his father, Edward, while Edward studied invertebrates in the Modean system. On other occasions Geordi was away from his father, on outposts near the Romulan Neutral Zone with his mother Silva. Geordi went to Zefram Cochrane High School sometime prior to 2353. He attended Starfleet Academy from 2353 to 2357, where he excelled at engineering and idolized Zefram Cochrane. His first deep space assignment was as an ensign aboard the USS Victory under Captain Zimbata. In 2362, La Forge participated in the investigation of the disappearance of the Federation colony on Tarchannen III. During a stopover at Starbase 324, the Victory underwent an inspection by Captain Jean-Luc Picard, then the head of Starfleet Tactical's Long-range Threat Assessment and Response Division. While being shuttled back to the starbase by Ensign La Forge, Picard made an offhand comment about a minor power inefficiency in the shuttle. La Forge took it upon himself to spend the entire night refitting the shuttle's fusion initiators, finally not only eliminating the inefficiency but obtaining an efficiency rating slightly above that rated for the shuttle. La Forge later transferred to the USS Hood, where he served under Captain Robert DeSoto. On the Hood La Forge knew William T. Riker, but only professionally. Riker knew La Forge the longest of all of their shipmates aboard the Enterprise, and the two developed a close friendship during their later years together at that assignment. In 2364, he was named conn officer on the USS Enterprise-D under Captain Jean-Luc Picard. While investigating the deaths of the SS Tsiolkovsky crew, La Forge contracted a variant of polywater intoxication, causing him to lose his inhibitions. Doctor Beverly Crusher used La Forge to test her vaccines and was able to develop a cure. The first test of his ability as a starship commander came during an encounter with an advanced planetary defense system in orbit around the planet Minos. With the senior officers' away teams entrenched at the planet's surface, La Forge gave the order to send the Enterprise's saucer section to safety and then returned to Minos with the stardrive section to work out a way of evacuating the away teams. While battling a cloaked drone in orbit, he devised a strategy to lure the opponent into the planet's atmosphere, thus revealing its location. In this tense situation, he proved that he had the ability to successfully lead a skeleton crew to victory. His special vision was impressively demonstrated during an away mission to the drifting freighter Batris. The VISOR data was directly transmitted to the Enterprise-D's main bridge viewscreen via his visual acuity transmitter, allowing the bridge crew to gain an insight into Geordi's view of the world and to follow the progress of the mission until the datalink failed. In 2365, La Forge was promoted to full lieutenant. He transferred from the command division to the operations division and was named chief engineer. Over the course of the next several years, it became evident that this transfer had been a wise decision. His technical and analytical abilities, his versatility, and his cooperative leadership style were very well suited to the requirements of a senior engineering officer aboard a major starship. An especially demanding situation arose in 2365, after the ship's main computer had been infected by an Iconian computer virus by way of the log files of the USS Yamato. Those files were the only useful item that remained of this Galaxy-class starship after a catastrophic loss of antimatter containment had caused it to explode with the loss of all hands. La Forge was eventually able to disprove suspicions of a general design flaw in Galaxy-class starships which had arisen when the alien program caused more and more shipboard systems to fail. Working with Lieutenant Commander Data, whose positronic brain had been infected as well, he found the solution to the problem in time to save the Enterprise-D from seemingly inevitable destruction. Geordi learned about one particular disadvantage of following in the footsteps of Starfleet's legendary engineers when members of a race known as the Pakled took him hostage, hoping to gain technological knowledge. Although injured, he successfully devised an escape method without further bloodshed. La Forge used a hologram of Dr. Leah Brahms, the engineer who designed the Galaxy-class, after the Enterprise was ensnared in a Menthar booby trap. He and the hologram Brahms worked extremely well together and figured out an escape route for the Enterprise. In the process, Geordi became strongly attracted to Brahms. Later that year, Geordi was trapped on a desolate planet with a Romulan. He and the Romulan at first tried to kill each other, but soon resolved their differences and worked together to survive. In 2367 he met the real Leah Brahms. La Forge was ecstatic at the chance to meet her, even if on a solely professional level, but he was in for a surprise. Whereas the hologram Geordi had assembled was kind, creative, and warm, the real Brahms was rude and, much to Geordi's chagrin, married. They worked together to solve a problem on board, but Doctor Brahms found out about the holoprogram and became infuriated. They were eventually able to laugh about it, but a romantic future for the two seemed unlikely. He met an old friend named Susanna Leijten whom he had served with aboard the Victory. She told La Forge that several of their crewmates, with whom they had formed an Away team to Tarchannen III, had disappeared. Shortly afterward Leijten started to transform into an alien being. La Forge too became infected, but before he was transformed into an alien, he discovered that shadow aliens on the planet had implanted a parasite into the away team members that turned them into the aliens. This was how they reproduced. La Forge was rescued and given an antidote that stopped the transformation. At the end of 2367, La Forge was captured by the Romulans, who brainwashed him into assassinating the Klingon Governor Vagh. Klingon ambassador Kell worked with the Romulans from the inside. By tracing Kell's signal to La Forge's visor, they were able to stop the assassination attempt. When the Enterprise was hit by a quantum filament that caused massive power failure throughout the ship, La Forge and Doctor Crusher were trapped in a cargo bay with dangerous explosive materials. They daringly decompressed the bay while they were still in it, to jettison the materials into space. He worked with the scientists on Penthara IV after the planet's mantle was damaged by an asteroid hit. His first plan failed, but a new one more risky than the first worked and the planet was saved. Later that year, the Enterprise discovered an injured Borg drone in the Argolis Cluster. La Forge helped to repair the drone and in the process made friends with him, naming him "Hugh". 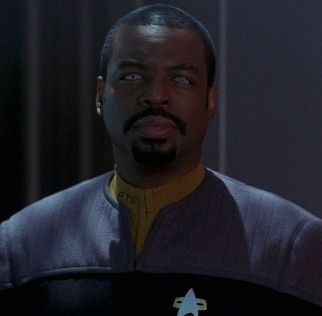 Starfleet initially planned to use Hugh to infect the Borg Collective, but Hugh's emotions, including those he felt towards his friend Geordi, prevented this plan. La Forge asked Hugh to remain on board, but he declined in order to ensure the safety of the Enterprise. After answering a distress call from a Romulan ship, La Forge and Ro Laren disappeared during a transporter cycle. They could see each other and everything around them, but no one was aware of them, and they were presumed dead. They discovered that the Romulan distress call was related to an accident with their cloaking device, and decloaked themselves by creating enough chroniton fields to force Data to use anyon particles to decontaminate the fields, which also rematerialized La Forge and Ro. In 2369 La Forge, along with the rest of the Enterprise principal crew, traveled back to 19th century Earth to save Data. In the process, Geordi encountered Samuel Clemens. One of Geordi's dreams came true later that year, when the Enterprise answered a distress call sent out by the USS Jenolan. He discovered that the ship's transporters were configured in a strange manner, and was able to rematerialize someone. That someone turned out to be Montgomery Scott, the Chief Engineer from the original USS Enterprise. Scott had preserved himself in the transporter buffer for 75 years. Geordi was initially overjoyed to be working with such a legend, but Scotty's constant nitpicking about 24th century technology led Geordi to snap at him. This plunged Scott into a brief depression. Geordi eventually consoled him, pointing out that age does not dictate usefulness, and the two worked together to save the Enterprise. He was abducted by solanogen-based lifeforms, who experimented on him. Later that year, he became romantically involved with fellow Starfleet officer Aquiel Uhnari, who was suspected of murdering her coworker. He eventually proved that the murderer was a coalescent organism. In 2370, he was captured by Lore, who was leading a group of rogue Borg, who had left the collective due to the individuality Hugh displayed, which Geordi helped to foster, in attacks against the Federation. Lore brainwashed Data into attempting to turn La Forge into a cybernetic organism. This plot was narrowly foiled. Later that year Geordi's mother, Silva, was listed as missing in action during a mission. Upon further investigation, Geordi found that her image was being used by aliens to lure him into helping them. He helped to prove that the Hekarans Serova and Rabal were correctly asserting that warp drive was damaging the fabric of space, which was instrumental in creating the warp 5 "speed limit". In 2371, while on an away team investigating the Amargosa observatory with Lieutenant Commander Data, Geordi was knocked unconscious by Tolian Soran. Soran then kidnapped Geordi and escaped aboard a Klingon Bird-of-Prey. The Klingons traded him for Captain Picard. They put a spy device in Geordi's VISOR and used it to obtain the Enterprise's shield frequency. The device was removed after the destruction of the Klingon ship, but unfortunately the damage suffered from the Klingons caused a coolant leak which he was unable to fix. This meant a warp core breach was imminent and also meant the inevitable destruction of the Enterprise. After the destruction of the Enterprise-D, he transferred to the new Sovereign-class USS Enterprise-E in 2372. He and the Enterprise then spent a year on a shakedown cruise. Some time between 2371 and 2373 he received ocular implants capable of even more impressive functions than his VISOR. This advanced technology no longer required an external apparatus to see. In 2373, the Borg attacked the Federation colony on Ivor Prime. The Enterprise was told to patrol the neutral zone; Geordi argued that the Enterprise-E was the most advanced ship in the fleet, and should therefore be at the front lines. After Geordi made his case, Captain Picard decided to head to the battle. After destroying the Borg cube, the Enterprise followed the Borg sphere that had left the cube into a temporal vortex it had opened in Earth's atmosphere. Geordi, along with the entire crew of the Enterprise-E, was transported to 2063. He and an engineering team beamed down to help repair the Phoenix, and La Forge got to work with his hero, Zefram Cochrane. He told Cochrane about his attendance at a high school named after him and a large marble statue erected in his honor. This rattled Cochrane, but he pulled together and made first contact as planned. The Enterprise then returned to the 24th century. In 2375, while investigating an incident involving Data on the Ba'ku planet, La Forge was able to temporarily see naturally through real eyes as a result of the metaphasic radiation emanating from the planet's rings. Despite this apparent gift, he, along with the rest of the senior staff, still assisted Captain Picard in working against the Federation's plans to exploit the planet, insisting that he would be unable to look at another sunrise when he was fully aware of the price that the Ba'ku would have to pay for his restored vision; in doing so, he was able to convince a reluctant Picard to accept the crew's help in saving the Ba'ku. It was during this crisis that he found himself coming to terms with the duplicate Aquiel Uhnari's arrival and starting a relationship with her. In 2379 he commanded the Piper team mission to infiltrate the nadion-pulse cannon firebase located on the summit of Mount Ranakar on Tezwa. Later that year, after Riker accepted command of the USS Titan, La Forge was offered the position of first officer of that ship. La Forge declined the offer. In 2379 Geordi took part in the Enterprise's mission to Romulus. After a fierce battle with the Scimitar, Geordi used a shuttle to rescue Captain Picard and Commander Data from the Scimitar before it was destroyed.